Help a few different bee species find a wonderful home with this Esschert Design Large Bee House. Many bees, including mason, horn-faced, and orchard bees, are quite mild mannered and solitary, and also provide excellent pollination in your garden. These bees tend to nest in holes, and this home offers a bevy of locations for them. The varied sizes of openings provide appropriate housing for a few different species, while the pine body enhances the natural appeal. The pitched roof protects the openings from the elements, and its metal top adds a bit of design and style to the unit. A hanger on the back of the piece allows you to display it on a wall or tree, while two legs enable it to rest on a level surface for a different look. The wood construction will certainly last for several seasons, and the unique shape brings a charming hint to your garden. 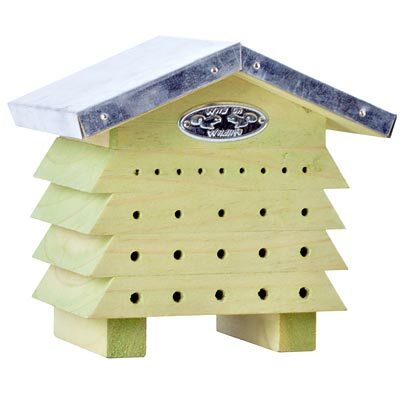 Invite wonderful, pollinating bees into your backyard with this Large Bee House.